Guarded heavily by Xenia’s Elijah Cushman and Logan Higgins, Fairborn senior Joe Nickel (5) passes the ball to Skyhawks senior midfielder Troy Herald, during the first half of Tuesday night’s boys high school soccer match in Fairborn. Herald returned the favor in the second half, assisting on two Nickel scores in the Skyhawks’ 6-2 win. Fairborn goaltender Zach Gillman follows the ball amid congestion in front of the Skyhawks goal, during the first half Oct. 9 at the Fairborn Soccer Stadium. The ball bounced wide to the left and out of bounds. Skyhawks freshman Donovan Dierker breaks free from the Xenia defense early in the first half of Tuesday’s Greater Western Ohio Conference American South boys high school soccer contest. Fairborn won to earn its first division title in 37 years. FAIRBORN — Ronald Reagan was our nation’s President, and Queen’s hit “We Are The Champions” was merely four years old when Fairborn last won a high school soccer title of any kind. This time, they had fireworks! 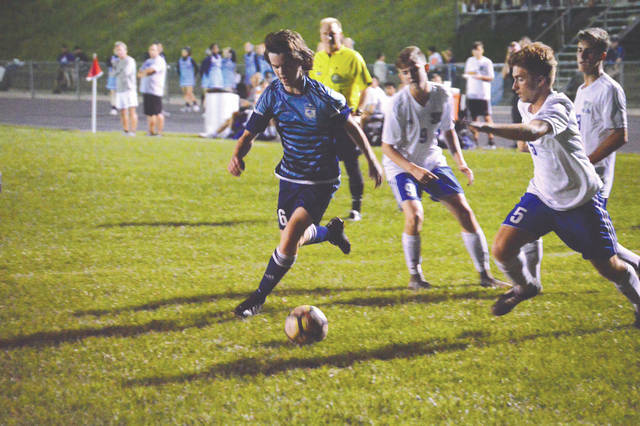 With Queen’s hit song ringing from the Fairborn Soccer Stadium loudspeakers, and fireworks lighting up the night sky, the Fairborn boys soccer team celebrated its first title since 1981, after beating rival Xenia by a 6-2 score. The Skyhawks (7-6-1 overall) led 3-1 at halftime off a Zayne Pacifico unassisted score, a goal by Troy Herald off an assist by Keegan Dierker, and an assist and a goal by Donovan Dierker. In the second half, Herald helped create three more Skyhawk scores. First, his offensive pressure and crossing pass to teammate Joe Nickel deflected off a Buccaneers defender and into the goal to put Fairborn up 4-1. Then, the Herald-to-Nickel scoring combo worked the next two times for the Skyhawks’ final scoring margin. Since 2014, Xenia had held a 3-1-2 advantage in head-to-head meetings between the two schools. The last time Fairborn had defeated the Buccaneers came in the 2014 postseason when Fairborn eked out a 7-6 overtime decision. 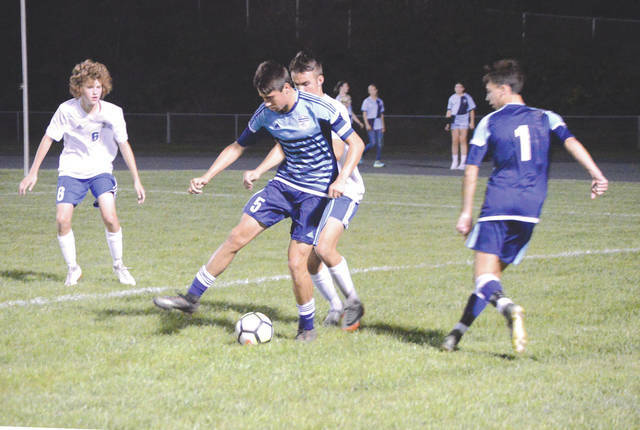 Tuesday night’s win earned Fairborn the title by just a half game over Stebbins, which had defeated West Carrollton that same night. Fairborn’s record in the GWOC South ended up at 6-3-1 while Stebbins’ finished at 5-3-2. Xenia finished third in the division at 3-5-2. 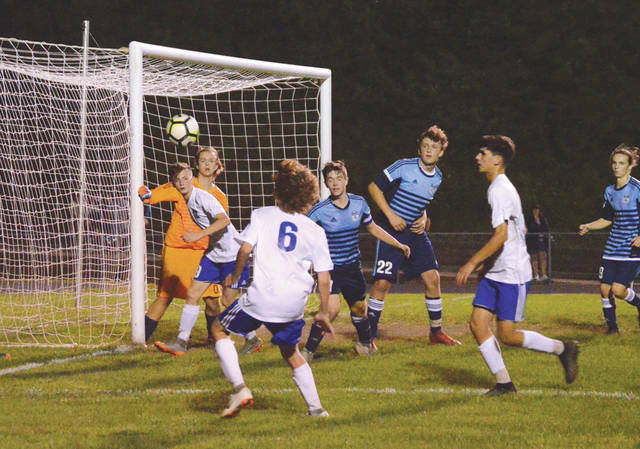 Xenia (5-9-2 overall) grabbed a first-half goal from Cameron Atkinson, then Noah Frisby earned a second-half goal off an assist from Nathan Mulikin, but that was all the damage the Bucs could do on this night. Trailing 4-1 roughly six minutes into the second half, Atkinson went on the attack. The senior midfielder/forward came up empty on five different scoring attempts in a six-minute span. Xenia also had a scoring drive off a corner kick clank off the crossbar and left post with just over 23 minutes left to go. Bucs coach Keenan Mikal wasn’t pleased with his team’s defensive effort. “Our goalie (junior Will Robinson) did a nice job back there for us, but he didn’t have very much support from anybody else out there,” Mikal said. Fairborn gets back into regular-season play at 7:15 p.m. Thursday, Oct. 11 when they play a match at Springfield. They’ll then close out the regular season at 7 p.m. Saturday, Oct. 13 on the road at Miamisburg. The Skyhawks‘ first foray into sectional tournament play takes place at 7 p.m. Monday, Oct. 15 when No. 10 seed Fairborn will host No. 11 Sidney.